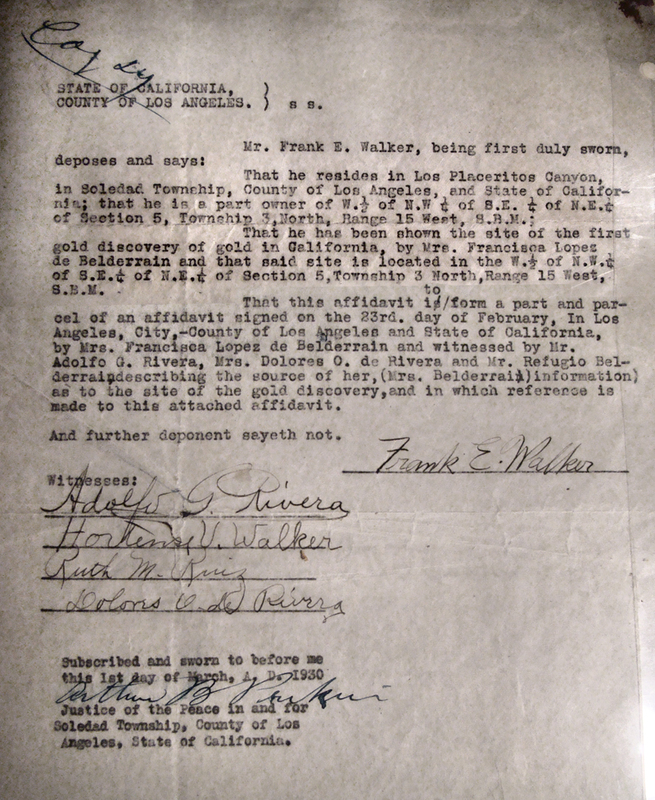 Frank Walker's Affidavit Re: Gold Discovery Site. Judge Arthur B. Perkins' copy of Frank Walker's affidavit of March 1, 1930, wherein Walker swears that Francisca Lopez de Belderrain showed him where her ancestor, Francisco Lopez, discovered gold on Walker's property in 1842. COUNTY OF LOS ANGELES. ) s s.
That he has been shown the site of the first gold discovery of gold [sic] in California, by Mrs. Francisca Lopez de Belderrain and that said site is located in the W.½ of N.W.¼ of S.E.¼ of Section 5, Township 3 North, Range 15 West, S.B.M. That this affidavit is to form a part and parcel of an affidavit signed on the 23rd. day of February, In Los Angeles, City,-County of Los Angeles and State of California, by Mrs. Francisca Lopez de Belderrain and witnessed by Mr. Adolfo G. Rivera, Mrs. Dolores O. de Rivera and Mr. Refugio Belderrain, describing the source of her, (Mrs. Belderrain) information as to the site of the gold discovery, and in which reference is made to this attached affidavit. And further depondent sayeth not. AP9010: 19200 dpi jpeg, compiled from digital images by Leon Worden, 3-2-2008, of original document in A.B. Perkins private collection.